MIDLAND, TX. — Former Chicago Cubs and Texas Rangers pitcher Ferguson Jenkins, “Fergie” has been named the keynote speaker at this year’s West Texas Sports Banquet. The event is scheduled to be held on Feb. 5, 2015 at the Midland Country Club. Jenkins will be the sixth Hall of Famer to speak at the banquet, joining former MLB Commissioner Bowie Kuhn, Dallas Cowboys great Bob Lilly, former MLB manager and executive Whitey Herzog, along with pitching greats Nolan Ryan and Bert Blyleven. Source: MRT.com. 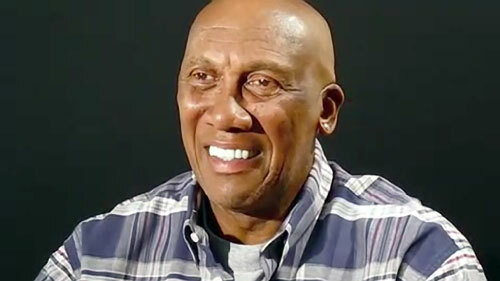 Photo shows Fergie Jenkins speaking in a 2009 interview about his life story. A silent auction will start at 5:30 p.m., dinner at 6 p.m. with the program beginning at 7 p.m. Other guests who are expected to attend this year’s banquet are new RockHounds manager Ryan Christenson, former RockHounds manager Aaron Nieckula, Texas League President Tom Kayser and RockHounds co-owners Miles Prentice and Bob Richmond. For more information contact the RockHounds at 520-2255. Less than two weeks after former Dallas Cowboys great Ed “Too Tall” Jones replaced another Cowboy, Jay Novacek, as special guest, Midland RockHounds GM, Monty Hoppel, found out that this year’s scheduled keynote speaker, Ivan “Pudge” Rodriguez, would not be able to attend for personal reasons. Hoppel had to do some last-minute scrambling to find another keynote speaker and that’s when Ferguson Jenkins stepped in. Watch Fergie Jenkins speaking about his career in a 2009 interview. Ferguson Jenkins won 284 games in his Hall of Fame pitching career with the Philadelphia Phillies, Chicago Cubs, Texas Rangers, and Boston Red Sox, and he is the first Canadian to attain such prominence in the American national pastime. Jenkins was a three-time All-Star and the 1971 National League Cy Young Award winner. In 1991, he became the first Canadian to be inducted into the Baseball Hall of Fame. During a 19-year career, he pitched for four different teams, spending the majority of his career with the Chicago Cubs. Sports Speakers 360 is a booking agent for pro athletes. If you would like to book Fergie Jenkins for a speaking engagement, appearance or endorsement, contact Fergie Jenkins’s booking agent for fees at 1.855.303.5450.